To cringe while watching another person gloriously fail is almost enough to make you feel inherently guilty. You shouldn’t, though. Cringing at somebody’s actions isn’t about pointing a finger and laughing in a derisively mocking manner. It’s a primitive emotion expressing deep, sincere empathy. If you cringe, it means that you care. This is how Eighth Grade makes you feel for 90 minutes straight. There are laughs because life always provides a good joke every now and then. Make no mistake though – this movie is a drama through and through, showing us that the misery of growing up is a shared experience despite the generational gaps between us all. Eighth Grade doesn’t blindly stamp a seal of approval on how our youth now want to manufacture themselves online, but more so reminds us that, in reality, we’re all just looking around to remember that we’re worthy of being seen. I think that’s a beautiful concept, and so is this heartbreaking, nail-biting, aching anxiety attack of a film. There’s one week left until 8th grade graduation and the story opens on Kayla Day (Elsie Fisher), talking directly to us via one of her YouTube channel videos. She lectures us about the many keys to confidence, all through the stumble and mumble verbatim of a real teenager, her self-help sermon full of “like” and “umm” and “uhhh.” Kayla’s no Nobel laureate, no poet, no writer. Nor should she be, and this doesn’t diminish her wisdom. She has the tools for success and the only problem is that while she can identify them in the tool box, she doesn’t actually understand their many uses. Kayla is an endlessly endearing character, not because she feels as if she’s being falsely performed, but entirely because the brilliant newcomer Elsie Fisher encapsulates and inhabits all of Kayla’s deepest insecurities through her own authentic self. We believe that Kayla feels alone in a digital world because Fisher imbues so much vacancy into her eyes. Such depth can only come from real experience, and the movie benefits from the unfiltered performance from its revelatory young heroine. Teenagers are weird creatures, and the movie allows them to be as wild on screen as they are in the out in the open. There’s the kid who masturbates in the back of health class when the lights turn off. School assemblies are full of groans and heckles and adults who can’t talk much better than the kids they teach. Around every corner is another tsunami of embarrassment. 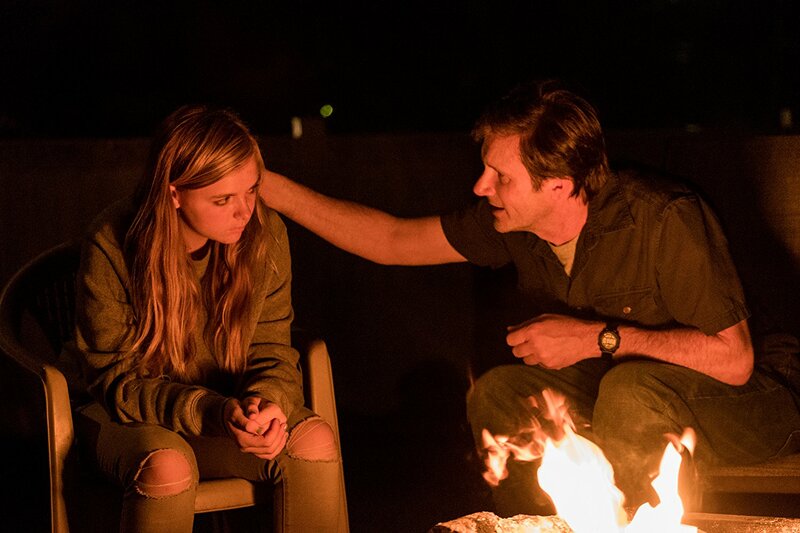 It’s not much better at home, where single dad Mark (Josh Hamilton) has no idea how to connect with the daughter he so clearly and ardently loves. Marks attempts to strike conversation as Kayla scrolls through her phone, headphones in, drowning in a pixelated, app driven world while incoherent to the tangible things surrounding her. We’re all guilty of such criminal disinterest with reality. 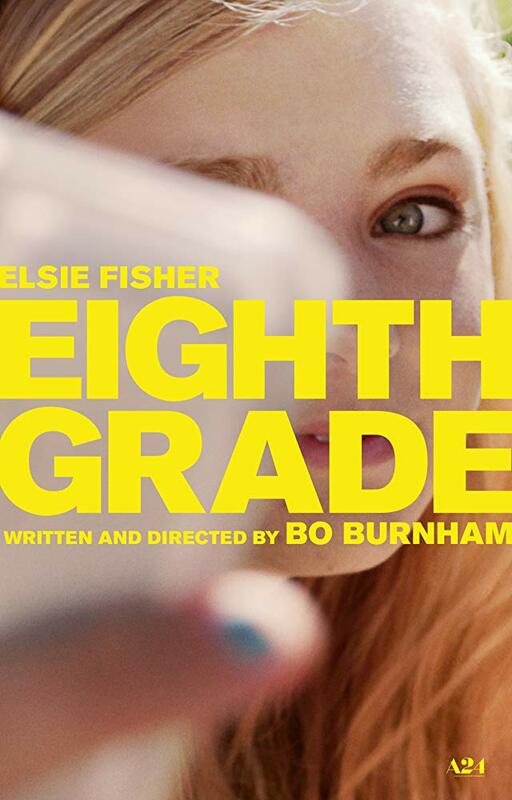 What’s so great about Eighth Grade though is that it doesn’t accost us or the characters, and it doesn’t enforce a judgmental sentence. The internet can be both good and bad, so grandiose and intimate, a place to potentially be found and so easy to be lost in. Isn’t that how we all felt in 8th grade? I sure think so, whether we like to admit it or not. I’ve never understood why so many people wish they had Peter Pan syndrome and could return to their youth. Life and experience normalize the trauma of the aging process, but close your eyes and think back to all of the harshest realities. How a few words on the playground could wreck your day, your week, your year. How children can be mean with no reason or real intent. How failing a test unequivocally spelled failure and how detention meant you were a bad person. How acne freckled your face and braces left school pictures without smiles. How telling your crush “I like you..” felt a whole lot like saying “I LOVE YOU LET’S GET MARRIED!” It’s a period of our lives that’s lived in all-caps. Some heroes fight bad guys and save the day. In Eighth Grade, an outsider girl with a heart of gold dares to walk into the waters of a pool party she wasn’t really invited to. That’s a hell of a lot more courageous if you ask me, or if you think about it through Kayla’s perspective as she walks the plank, expecting to sink even in the shallow end. One of the best and most compassionate feature film debuts I’ve ever seen, the creative genius Bo Burnham – one of the first YouTube celebrities and a musically driven stand-up comic with an understanding of life far beyond his years – gives us the kind of quirky, eccentric film that the great Richard Linklater explored in Boyhood. Linklater wanted to see how we change as time passes, and Burnham uses his film to explore how we pass the time in day to day life, wasting so much of our running clock in great futility and want. We look at our phones. When they’re charging we look at computers and iPads. So it should be of no surprise that the movie hits the hardest when the characters aren’t lit by a fake ambient light, but rather when they light up through the joy of honest and earned face to face communication. Eight Grade – with all of its pop-culture and technological specificity – might not age well, but then again, do any of us? I absolutely loved this movie.